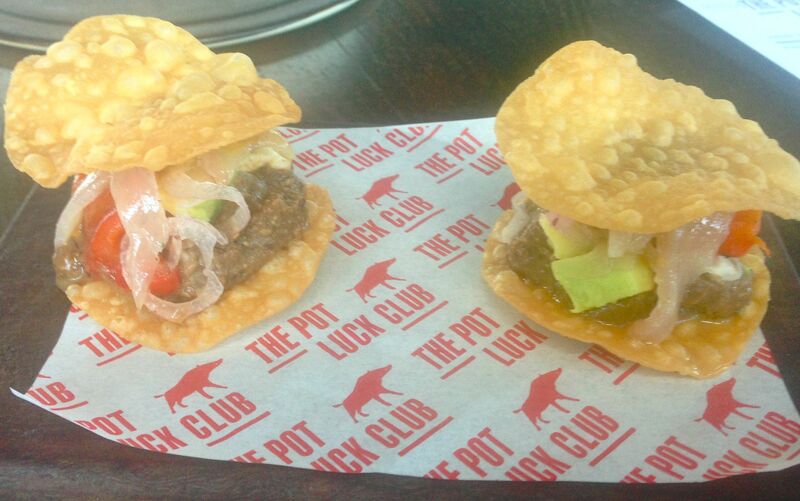 The Pot Luck Club is in the hip part of Woodstock called The Old Biscuit Mill. A glass lift with views of the mountain whisks you up to the sixth floor where Chef Luke Dale Roberts serves up amazingly innovative food in tapas-style sharing plates. Dishes are divided into flavour profiles, so you have five sections to the menu: Salty, Sweet, Sour, Umami and Bitter. People frequently ask me what Umami means and I’m sure I never answer entirely correctly. So here goes! Umami (a Japanese-coined name) is the fifth taste we can perceive with our tongue, a taste that is described as rich, rounded and savoury. Some umami-rich foods are soya sauce, miso paste, cured ham, cheese, tomatoes, ketchup and mushrooms. Now that’s cleared up, on to the food. As a novel way of ordering you’re handed a pad and pencil to jot down your choices. All of them…but as our waiter informed us, if at any stage you feel like you can’t manage any more, simply say so and your order will be stopped at once. And of course there’s no problem in ordering more. From the Sour section we went for Pot Luck Club Fish Tacos. 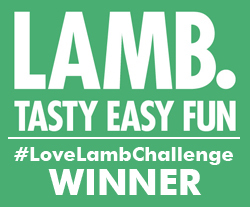 Beautifully fresh with tender fish, a zingy lime dressing and crispy tacos. Love their paper, too! The Heirloom tomato and sashimi salad was from the Umami section. 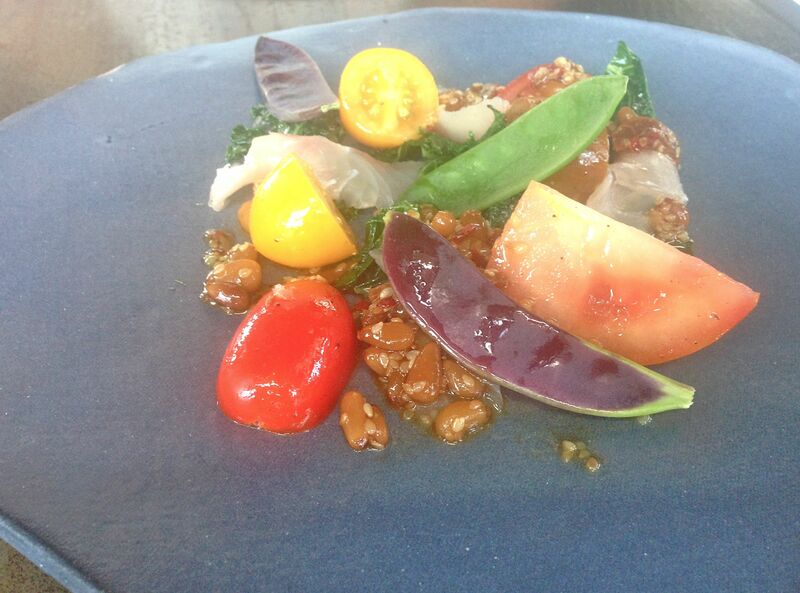 The freshest of sashimi, sweet and juicy tomatoes and an amazingly rich dressing with pine nuts. And purple mange tout! The Salty section offered up this beer battered fish, cardamom and saffron mayo with green mango atchar. Wow! I can’t remember tasting such magnificent batter, light, crunchy and flavoursome, encasing sweet and moist fish. All made perfect with a dollop of cardamom and saffron mayo. This is when you wish you weren’t eating tapas – I needed a whole plate of this. Another choice from the Sour section, duck breast with naarjtie and yuzu dressing. 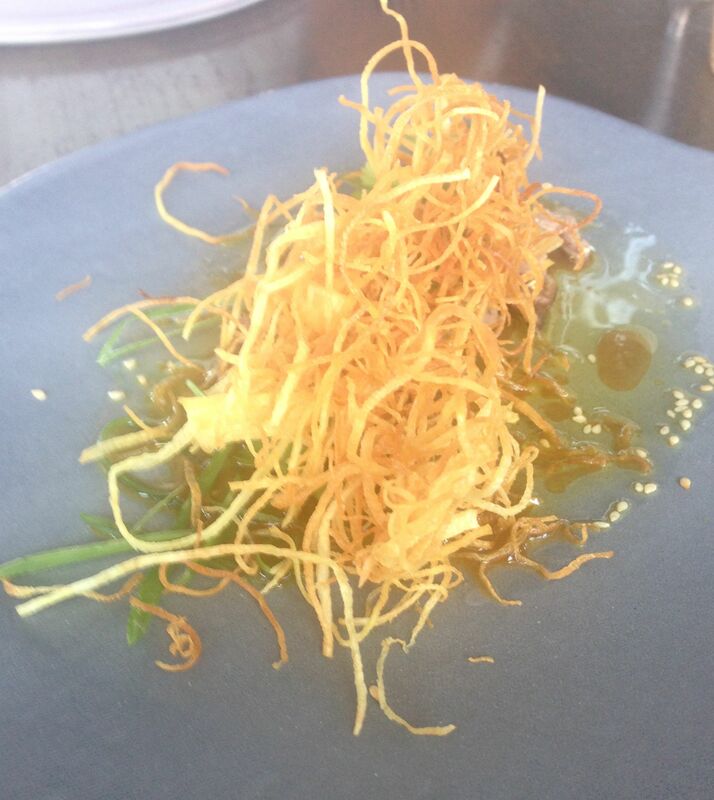 Yuzu is an Asian citrus fruit, so this was a wonderfully zesty dish with tender, rare slices of duck and a topping of crispy potato strings. 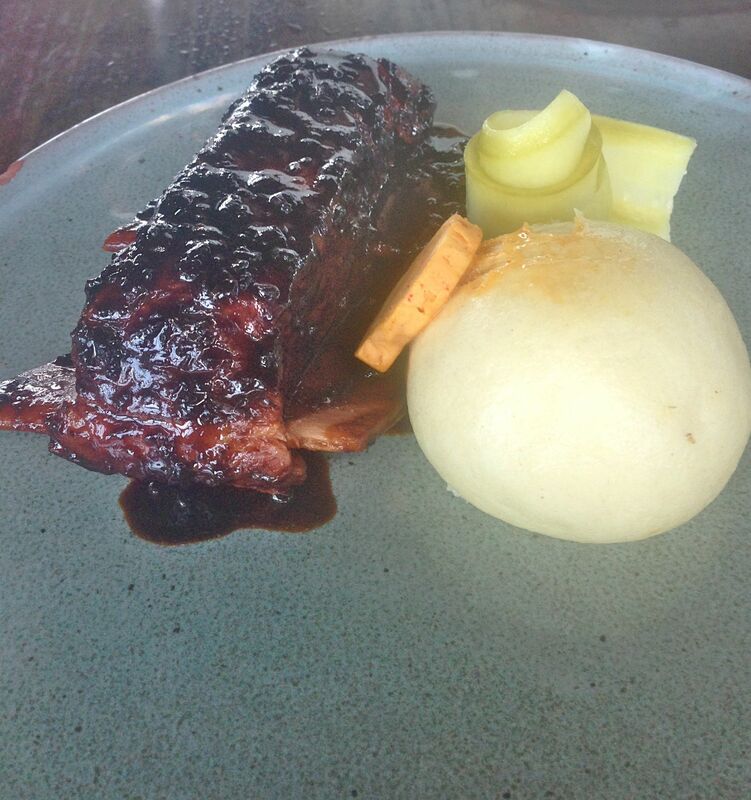 Our final savoury dish came from the Sweet section – Doenjang glazed beef short rib with steamed bun and pickles. A touch of Korea! The meat was rich and sticky and fell off the bone, the pickled vegetables added crunch and acidity and the bun was soft and comforting. Now for dessert! I recently waxed lyrical about a souffle that could be the best dessert in the world…would you believe it, within a few days I was tasting another candidate for the honour! 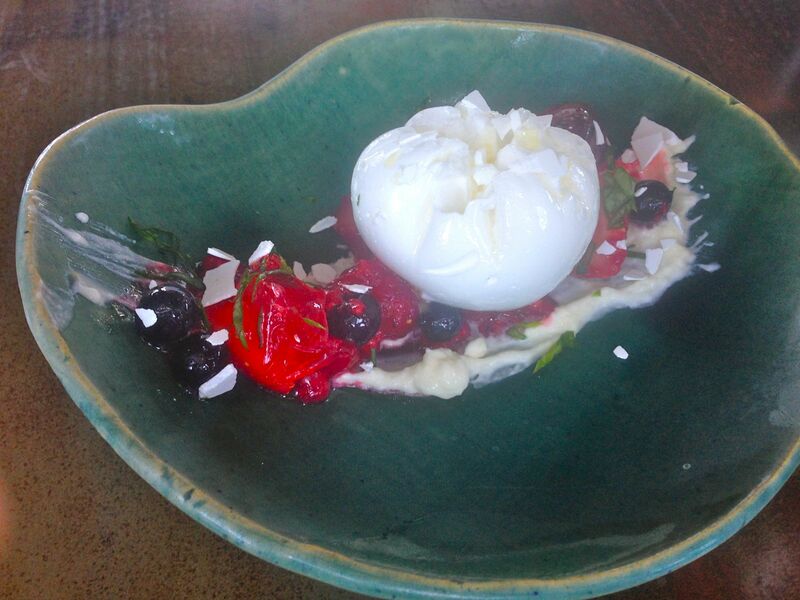 Poached meringue came with fresh summer berries and passion fruit curd. The meringue was soft and silky and literally dissolved on your tongue – and the passion fruit curd was inside. Combined with zesty fresh berries, this amazing combination of tastes and textures is a delight. 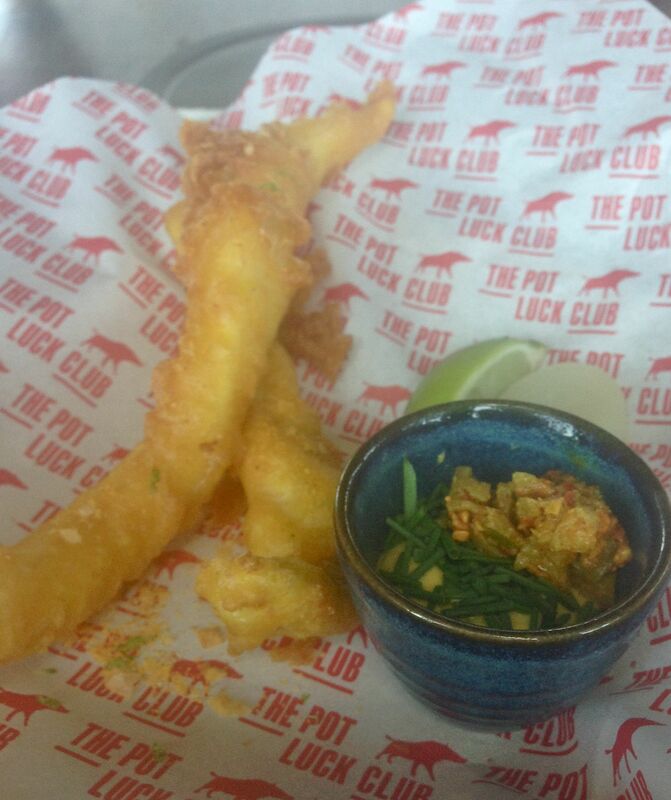 The Pot Luck Club was nominated as one of the top-20 restaurants in South Africa in the 2014 Eat Out-Mercedes Benz Restaurant Awards. It’s certainly up there for me. Great innovative food that tastes like a dream without being unnecessarily complicated, as well as a relaxing experience with great service. The staff have got the serving down perfectly with just the right amount of time between dishes. My plan for my next visit – to go with a big group of people and order everything on the menu…when I can get a table, that is…it’s so popular you need to book weeks in advance. But that’s not surprising. I love this! Please take me next time? ?